One of my favorite franchises of all time is The Legend of Zelda. Few dare to attempt to make games like it, and the ones that do don't do the type of game justice. Ansimuz Games is the next to try to make a Zelda-like game, and the end result is Elliot Quest, releasing today on the Wii U eShop. Here's my verdict on the game. Despite the series being so popular, The Legend of Zelda series has seen few imitators. Perhaps that is a testament to just how hard it is to nail the concept and do it well. That notwithstanding, outside of major publishers, indies have decided to take on the style of game, such as Ansimuz Games. This developer worked on Elliot Quest, a game that owes a lot to the design philosophy and formula of Zelda II: The Adventure of Link, in present day, more of the black sheep of the Zelda series. It's incredibly difficult to properly design a Zelda-like experience for even an AAA developer, so it's definitely no small feat for an indie studio. Thankfully, Ansimuz Games's Elliot Quest is a rousing and entertaining success in this department. 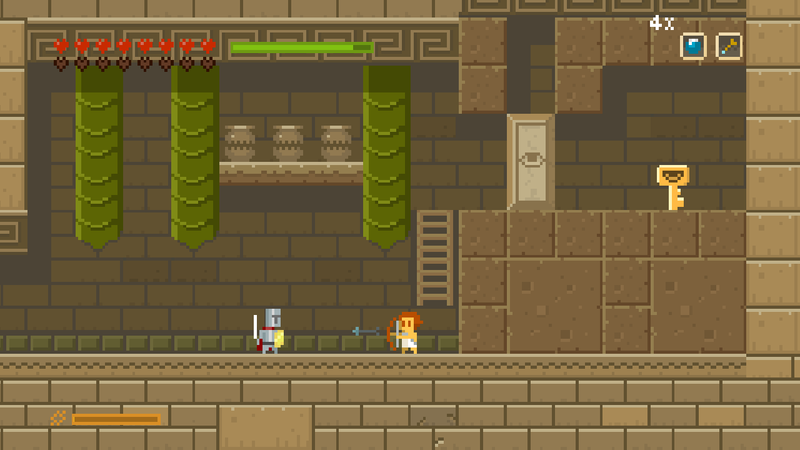 Elliot Quest is pretty much a more beginner-friendly Zelda II. Deaths are punished nowhere near as severely as the game it is modeled after. Instead, you just lose a chunk of your gained experience, a modest price to pay, and return to the last save point you arrived at. Seeing as there is a fair abundance of save points in the game, this is also no harsh penalty. 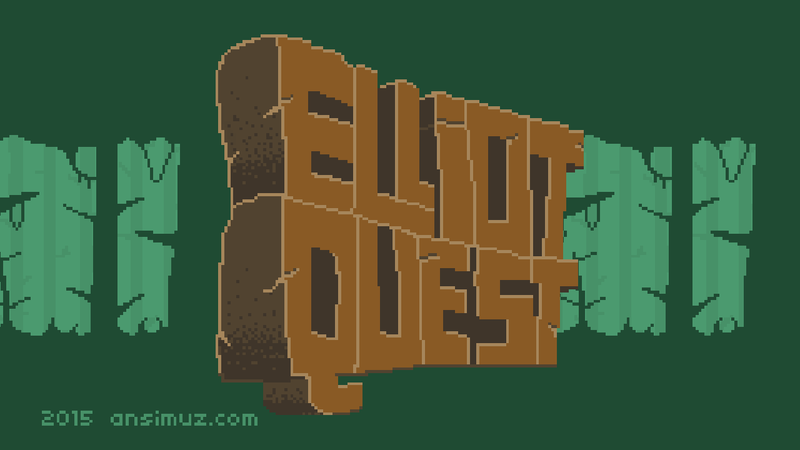 Like Zelda II, though, Elliot Quest decidedly has old school sensibilities. This is most apparent in how the game directs the player to what he or she needs to do next. Well, actually, that is to say that Elliot Quest doesn't actually direct the player at all. It's up to the player to explore on their lonesome to decide where to go next. This can be seen as a positive or a negative thing. For one, there is a grand amount of freedom and no hand-holding to be found. On the other hand, it can be tedious to aimlessly wander from area to area hoping the place you're visiting is the next place you have to go to further the story. 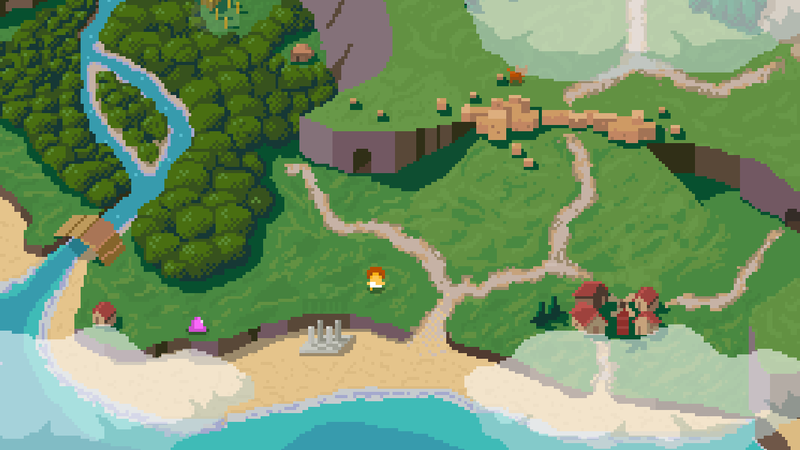 The overworld map is packed with places to go. The similarities to Zelda II do not end there. There is a smaller overworld map to explore, but it's so dense and packed with places to venture into. Each area is a 2D side-scrolling affair, where Elliot must use his powers and abilities to defeat enemies, solve puzzles, and remain healthy to survive the challenges and obstacles that wait him. Speaking of enemies, the influences are quite strong here, from snakes that speed up when they see Elliot (much like Ropes do in the Zelda series to Link), to enemies with an iron mask that can only be attacked from behind (much like Helmasaurs in A Link to the Past), to enemies that leap up and down (much like Zelda's Tektites). There's even magic and health upgrades to gather to make the adventure an easier one for those that do some rigorous searching. Didn't I see you snakes in another game? Perhaps one that inspired this game? There are towns where Elliot can chat with locals to get advice and hints, shops selling goods like health potions and bombs, and yes, even houses to enter where Elliot can pilfer coins from treasure chests from. Although the latter isn't recommended by multiple NPCs, as karma has a way of getting to a person, no matter how young or old. Outside of towns, the side-scrolling areas of Elliot Quest are where the action primarily takes place. There are forests, fjords, caves (even following Zelda II to a "T", requiring a Candle item to be able to see inside them), ruins, and more to venture through. The biggest challenges come from the temples. These are set up just like dungeons in The Legend of Zelda series, having Elliot acquire keys to open locked doors, finding maps to get a blueprint of the temple in question, acquiring the temple's special item, and challenging the temple's boss to complete the dungeon. These temples are the most engrossing and enjoyable part of Elliot Quest, but the rest of the gameplay is nothing to overlook, either. to The Legend of Zelda series's. 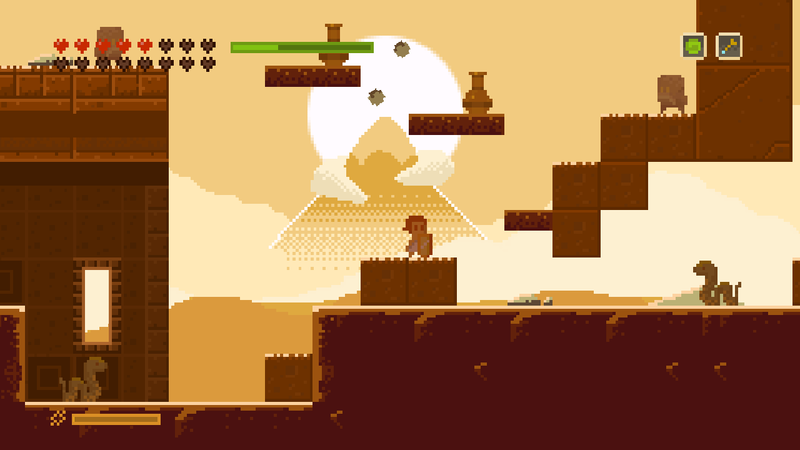 There are also Metroid influences to Elliot Quest's design. 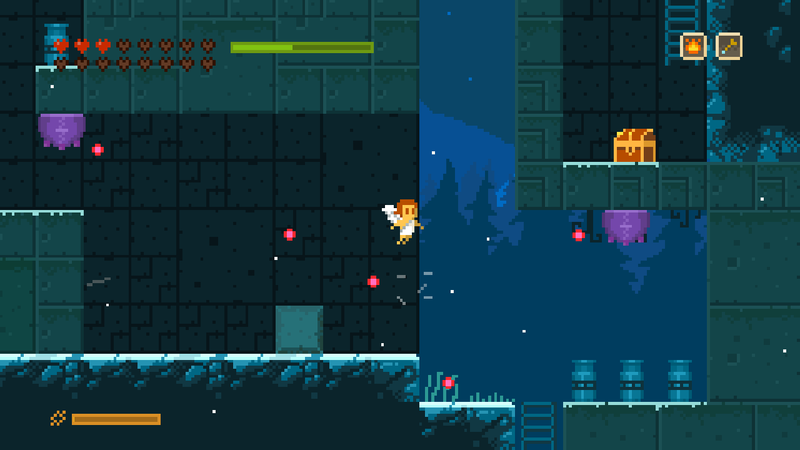 As new items are acquired, such as a bomb bag, a whirlwind item, a flame item, and a wing that bestows the ability to double jump, Elliot can return to past areas of the game to reach new previously inaccessible spots and places, finding treasure chests holding coins and presenting Elliot with new paths to take. Like with the open ended progression of Elliot Quest, it can be rather difficult remembering where these sections are, since there are so many areas on the overworld map to explore, and there is no documenting feature to make note on an area's map where points of interest are located. Here, much like old school games of yore, it's recommended to keep tabs on where you find locations you can't currently reach. In that regard, if this game has an instruction manual, the usually unused "Notes" section at the back of the manual would actually show some usefulness this time around! These abilities and items have multiple uses outside of their intended ones. For instance, it was quite rewarding to learn on my own that blue goo-like enemies can be set on fire to easily dispose of them rather than unleashing over a dozen on them to defeat them. Little discoveries like this made Elliot Quest all the more engaging for me on a player level. It's discovering these things on your own where Elliot Quest becomes all the more rewarding to play, a spot in the game where it being vague is a good thing. a wing and a prayer to survive. As Elliot starts his titular quest, he has as unassuming level of power. For instance, his arrows that he fires at foes don't fly that far. However, as enemies are defeated, Elliot gains experience which allows him to power up and reach new experience levels. This grants the player the opportunity to select an attribute to level up, such as Wisdom and Vitality. Elliot's arrows can not only fire farther, but they can fire faster if that attribute is chosen to be leveled up by the player. Hearts that restore health can doubly do so occasionally, or damage dealt to Elliot can even be halved, depending on the attribute the player levels up. The Wii U version of Elliot Quest offers play on both the Wii U GamePad in off-TV mode and regular play on the big screen. With the latter, players can use the GamePad as a helpful map, as a means to equip and unequip abilities to the Y button, and see their leveling up progress. It's essentially all the functions of the pause menu done in real time. This menu is helpful to have on the Wii U GamePad. At the same time, off-TV play is mighty nice. Elliot Quest's old school flavor permeates in its presentation as well, offering an old school art direction that is heavily reminiscent of Cave Story. It's not perfect, as there are some noticeable artifacts in the form of vertical lines that occasionally pop up on walls, ceilings, and floors. It can be a little jarring, and once I noticed them, it was hard to try to ignore them. I've also experience split seconds of slowdown when performing certain actions like attacking and jumping. These are so quick, however, that they aren't a detriment to the gameplay. The soundtrack of Elliot Quest is one that has solid influences from Super Nintendo soundtracks, such as The Legend of Zelda: A Link to the Past. 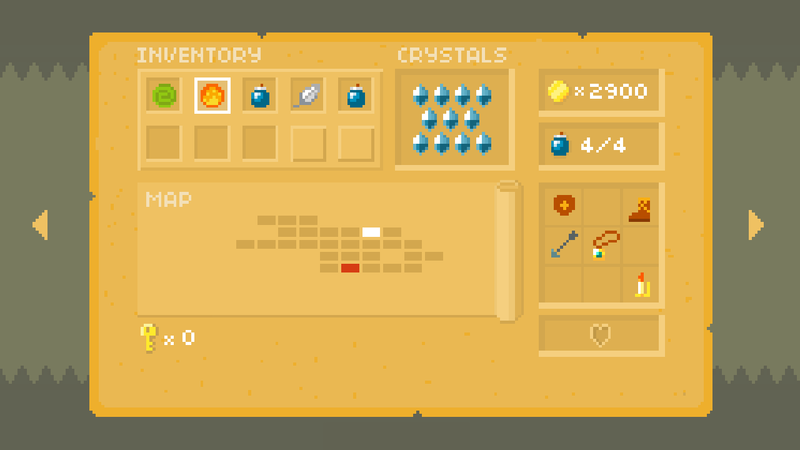 It's a strong soundtrack that keeps the player entranced in Elliot Quest's world. Sometimes there are games that come out of nowhere that you aren't expecting to be as good as they are. Elliot Quest is one of these games. It follows the Zelda II school of design closely, but feels and plays differently enough that it's an entirely new beast of its own, and is a better game for it, too. If the idea of exploring a myriad of area types, defeating enemies both small and large, obtaining new items to access once unreachable areas, and doing all of this with an incredibly limited amount of hand-holding appeals to you, then Elliot Quest is without question a download for the Wii U that you need to head to the eShop to obtain... Now.